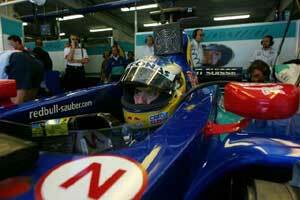 They have identical engines, but the fortunes of Sauber and Prost in 2001 could scarcely be more different. One has been the talk of F1 after its best-ever performances, the other's pre-season hopes have been dashed by feeble efforts. So why is one doing so well and the other so badly? "It would be incorrect of me to make a comment about both teams, as they are our customers," says Ferrari sporting director Jean Todt. "But yes, you can say that Sauber has been very impressive." When Peter Sauber expressed the view that his team had to beat Arrows this season, during the official launch of the Red Bull Sauber Petronas C20 in Hinwil late in January, he didn't quite mean it like that, as if his ambitions were focused at only half mast. This is a man, don't forget, who dislikes having to speak English in front of an audience, and who is far happier addressing crowds in his native Swiss-German. Sometimes these things can lose something in the translation. In fact, no less an authority than Michael Schumacher had already voiced the opinion that Sauber should at least start the season well. "I have seen good things on the new car," the World Champion said. On the track the C20 showed promise in testing, and so it continued when the racing started. In the hands of two young drivers, one coming out of a bruising first season in F1 with Prost, the other with only 23 car races to his credit, the C20 proved surprisingly competitive. Nick Heidfeld finished fourth in Melbourne, Kimi Raikkonen sixth; since then the German has been on the podium in Brazil, and the points tally after Raikkonen's fourth in Austria was 12. The C20 is a significant evolution, and a much more efficient package than the C19. Besides having the mandatory stronger monocoque, a new gearbox and superior aerodynamics, it is also much lighter. Like a supermodel, an F1 car should never gain weight. The C20 betrayed much evidence of a winter diet, with the main masses - the engine and gearbox - bringing particular advantages in this respect, and new lightweight suspension components playing their role. Rinland used a greater amount of carbon fibre and Kevlar to meet the new side impact and rollover hoop tests, as well as other high-tech materials such as titanium and ceramics. They all help to reduce rolling resistance, and confer greater longevity, better strength and reduced weight compared to steel. This significant weight reduction has enabled the team to position more ballast in a wider range of locations, and that has clearly paid off as the cars regularly qualify in the top 10, a vital factor in helping them to score points in races. The work on the C20 started earlier than ever at Hinwil, enabling the first test to be conducted at Fiorano in January. Besides being fast, the C20 has been reliable, and while it has delighted the drivers it has also delighted the mechanics because it is so much easier to work on than previous Saubers. 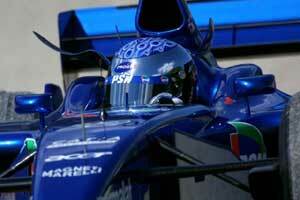 The Prost AP04 was the work of Loic Bigois, since deposed as technical director by ex-McLaren aero man Henri Durand. It pursued similar aims: conformity with the new aerodynamic and chassis strength regulations, greater aero efficiency and weight saving, while the Ferrari engine and transmission was a godsend after the troublesome Peugeot V10. Right out of the box the AP04 looked very good. So good that Jean Alesi was still very excited about his prospects. "This car feels so good compared to last year's," he enthused. "It has power and grip and it is reliable. And yes, I really am looking forward to challenging for points again." The car had been very quick in testing, especially in Barcelona, but it was all an illusion. The team insisted initially on running in qualifying trim, to set quick enough times to persuade vacillating sponsors to sign up. "I understood that," Jean says now, "because I understood the importance of funding. But the time came when we had to stop that, and initially the team did not want to. But we were just fooling ourselves. We had to go back to running with a high fuel load to develop the car the way all the other teams do, not with 15 kgs." Part of the Prost's problem is that is does not generate sufficient aerodynamic download, nor does it yet make good use of its Michelins, which BMW Williams has shown to be very effective on some types of circuit. So far the car has failed to record a convincing performance, though Alesi's talent nearly took it to a point in Brazil until the refuelling system malfunctioned. Sauber has clearly benefited from having two hungry young racers. The first thing any team needs is a driver who will let everything hang out in the quest for a fast lap. That often means a young guy such as Heidfeld who really wants it, rather than a canny veteran such as Salo with a more highly developed sense of self-preservation. The next thing you need is another one of them, such as Raikkonen, to ensure that they push one another. Heidfeld's situation at Prost last year highlighted the absurdity by which some judgements in F1 are made; while Jenson Button rightly got much of the ink, fellow rookie Heidfeld was generally dismissed because of a nightmare situation within Prost that was well beyond his control. In his F3000 days he tended to come across as bland, which certainly didn't help, and last year he kept his own counsel during the sort of catastrophe that can destroy a driver's psyche. But his form now confirms that a feisty little racer lurks beneath the schoolboy looks. In 2000, he did a good job against Alesi. The Prost AP03 may have been a dog, but you don't outqualify a charger like Alesi seven times out of 17 without having a high level of ability and commitment. "It is just a pleasure," Heidfeld says with undisguised relief, "to be able to drive a car that works, and that keeps working." Likewise, Raikkonen has proved to be a real discovery, and despite his speed his driving has been remarkably free of incident. At Prost, meanwhile Jean Alesi fought alone for the first four races, after Alain Prost was obliged to chase the PSN money and to hire Gaston Mazzacane as the veteran Frenchman's team-mate. Now that Luciano Burti has been taken on in Mazzacane's place, Alesi has a partner who will push him and who will also help him to sort out the car. Both teams are exposed on the technical side. At Sauber technical director Willy Rampf and his team will have to work hard to shore up the shortcoming of sacking designer Sergio Rinland. The amiable Argentinian left the team in circumstances yet to be explained fully, and has been replaced as chief designer by little-known Englishman Stephen Taylor. He moved from the composites department at McLaren and officially joined the team at the beginning of May. He faces a tough job settling into a promotion and learning how to get the best out of another designer's car. In 2000 Sauber really learned for the first time how to juggle finance and research and development to keep a car good all through the season. Historically the team had been competitive at the start of the year, only to fade. "It was still not good enough, because we must make progress, not stand still," Sauber says, "but it is a problem when you are a small team." So far Sauber has managed to maintain the highly impressive momentum of its best-ever start to a season. The sceptics said it wouldn't, but the is proving them wrong. The lack of continuity in the design department is something to overcome, but equally critical is the relative lack of funding in comparison with its closest rivals, BAR and Jordan. Both have a lot more money and therefore the potential to develop their way clear of the interloper. Ditto Jaguar. And almost certainly long-term sponsor Dietrich Materschitz of Red Bull will part company with Peter Sauber at the end of the year. Funding is less of a problem for Prost, but is nonetheless a consideration. Burti was sent over from Jaguar with a dowry that washed away Prost's intention to sue Jaguar for luring away its test driver Pedro de la Rosa at the beginning of the year. Sauber is harmonious, but internal politics risk tearing Prost apart as Alain Prost fights with shareholders Abilio and Pedro Diniz. This makes it clear that the internal strife that led to the dismissal of design chief Alan Jenkins in 2000 is far from resolved. So far this year Sauber has kept on hitting the sweet spot, despite the different nature of the circuits which have hosted races; at Prost the struggle goes on to identify that spot, let alone to attain it.